A Zoo in Winter is the latest translated graphic novel from the mangaka Jiro Taniguchi. 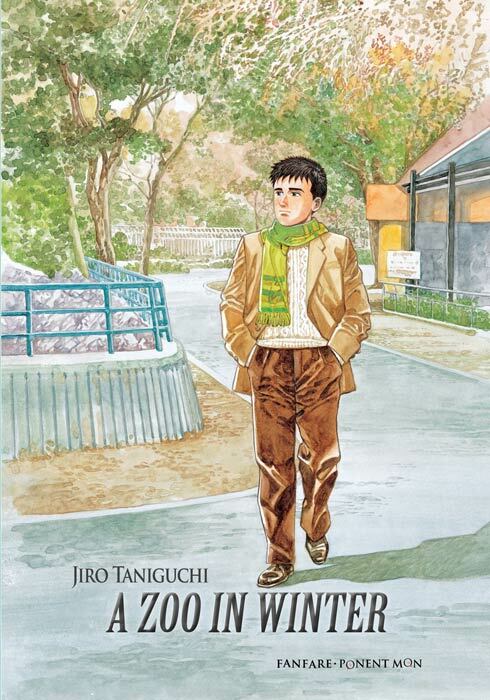 A Zoo in Winter is based on Jiro Taniguchi’s youth when he broke into the manga industry as an assistant. 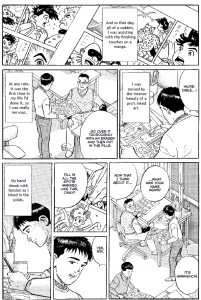 I do not think this is the best graphic novel in the Jiro Taniguchi canon or is it one of my favourite but it is worth reading for anyone who is familiar with Jiro Taniguchi. A Zoo in Winter follows a teenager named Hamaguchi who dreams of becoming an artist. His first job is working in the deliveries department of a Kyoto textile manufacturer that makes scarves and neckties. He hopes to design some fabric patterns for the company but any chance of a promotion is bleak after an incident involving the owner’s daughter. He decides to quit after landing a job in Tokyo as a manga artist assistant drawing backgrounds and filling in the solids. This graphic novel mainly chronicles his first two years as an assistant as he progresses as an artist. I found that A Zoo in Winter was a bit slow in the beginning chapters but gets more compelling later on. I think the reason why I was not very engaged early on was because of the way the story is structured and it is not something that could be avoided. Essentially, this graphic novel starts twice with chapter one introducing you to Hamaguchi and his life in Kyoto and with chapter two introducing you to Hamaguchi’s new life in Tokyo where he becomes an assistant. Chapter one is almost like a self-contained story because everyone you meet in this chapter does not appear in the rest of the story except for one who makes a brief appearance in the final chapter. Chapter two introduces you to a new set of characters so any momentum built in the first chapter is gone. As Hamaguchi settles into his new job, the story becomes more interesting as you get to see what the life of a manga professional is like without the drama shown in the current Bakuman series. Creating manga is all about meeting deadlines and since the mangaka Hamaguchi works for is responsible for one 18 page weekly serial and two monthlies, pulling all-nighters are common to complete the manga pages. The best part of A Zoo in Winter is the latter chapters in which Hamaguchi meets and falls in love with his muse as he creates his first manga. 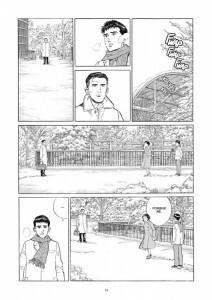 Jiro Taniguchi’s strength is his art and A Zoo in Winter shows it off rather well. All his panels are rendered beautifully and his backgrounds are exquisitely detailed. 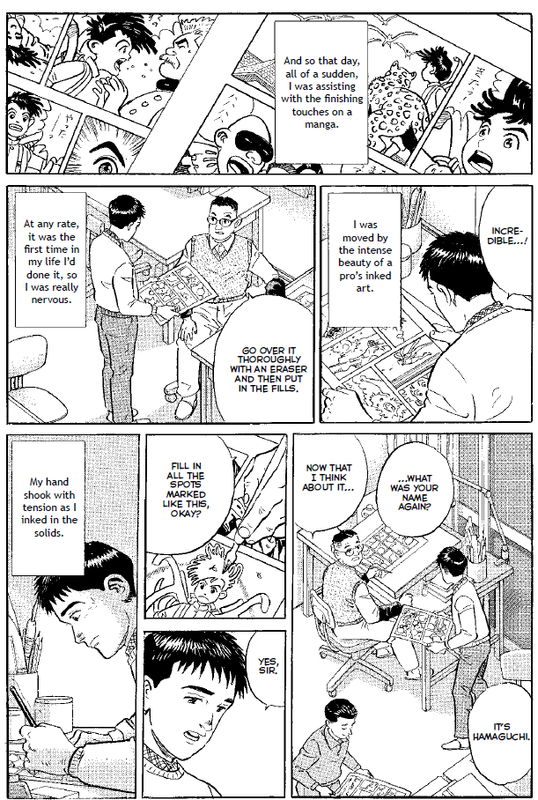 The art in this graphic novel is everything you should expect from a Jiro Taniguchi book. Finally, I noticed the lettering to be rather poor in more than a few panel of the first chapter. This graphic novel is read from left to right but the panels I had confusion with had the word balloons positioned more appropriate for a story that read from right to left. A Zoo in Winter was originally published in Japan in 2008 and read right to left. I wonder if reversing the reading order caused some of these lettering problems. For more information about A Zoo in Winter, go to the publisher’s (Ponent Mon) website. 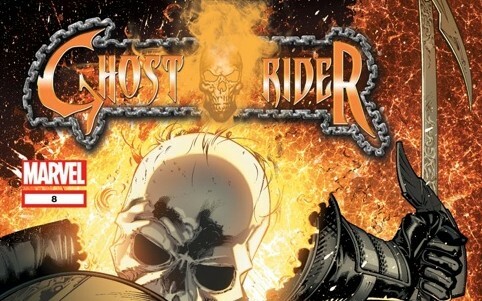 This graphic novel is $23 USD but is available in both the Hamilton and Toronto Public Library system. A Zoo in Winter is a good story with great art. This graphic novel is not Jiro Taniguchi’s best work and people who are not familiar with this mangaka may give up on it. However, the story does gets better and ends in a satisfying manner. For anyone who wants to give Jiro Taniguchi a try, I recommend you read The Walking Man and A Distant Neighborhood first before reading A Zoo in Winter.